MUNICH, April 12, 2019 /PRNewswire/ -- Zoomlion Heavy Industry Science & Technology Co., Ltd. (Zoomlion) unveiled its grand exhibition at bauma 2019 on April 8 in Munich, Germany. The leading Chinese construction machinery manufacturer debuted its latest aerial work platforms and four flagship forklift products with CE marking in Europe. Zoomlion uses its world-leading intelligent production lines to build its aerial work platforms and forklifts, which have been developed with meticulous craftsmanship combined with innovative and sustainable technologies. 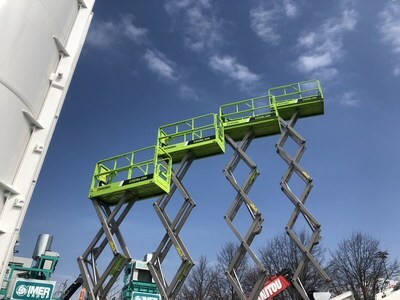 At bauma 2019, Zoomlion is highlighting four electric scissor lift platforms that emphasize reliability, simple operation and high efficiency: the ZS1212DC, ZS1012DC, ZS0808DC and ZS0608DC, all of which meet the strict quality standards of China, Europe and U.S. to provide a safe, efficient and comfortable operating experience. The four models cover heights from 6-12 meters with a maximum workload of 380 kg. They can be used in a wide range of building and industrial workshop construction projects, as well as for house decoration and maintenance. Compared to a hydraulic drive, an electric motor has double the moving efficiency with the added advantages of a low center of gravity, stable operation, heavy load capacity and adaptability in poor working conditions. Zoomlion has also developed special lithium-ion battery for the aerial work platform that are maintenance-free throughout the full life cycle, while improving the battery performance by 30 percent and tripling the battery life of traditional lead acid batteries to suit the needs of the rental market. Zoomlion is continuously breaking new ground in industrial vehicles with more competitive products and services. The company is exhibiting four of its top forklift products at bauma 2019: the FD30H, FB20H, FE18H and DB16W, among which the FE18H three-point battery balanced weight forklift is an upgraded product with a dynamic design and high maneuverability that allows the operator to control the vehicle with one hand via its new operating handle. Meanwhile, the FD30H internal combustion counterbalance forklift is equipped with LED lights and a high-performance exhaust system that lowers noise and pollution. Designed to satisfy international clients' needs, all four models have fully met the European Union's safety standards and obtained CE certification. Founded in 1992, Zoomlion Heavy Industry Science & Technology Co., Ltd. (Zoomlion) is a high-end equipment manufacturing enterprise that integrates engineering machinery, agricultural machinery and financial services. The company now sells nearly 800 cutting-edge products from 49 product lines covering nine major categories. Zoomlion is China's first construction machinery company to be listed on both the Shenzhen and Hong Kong stock exchanges.